I imagine that this is one of very many pieces published today as a personal recollection of the events of September 11th, 2001. I’d lost my job at a US investment firm at Canary Wharf in June that year, and in September I was still enjoying what amounted to an extended holiday in London. I was idly surfing the Internet with the TV on behind me in my South London flat, and at the end of the programme a news bulletin appeared. It showed a live image of the World Trade Centre from a camera a few blocks away. 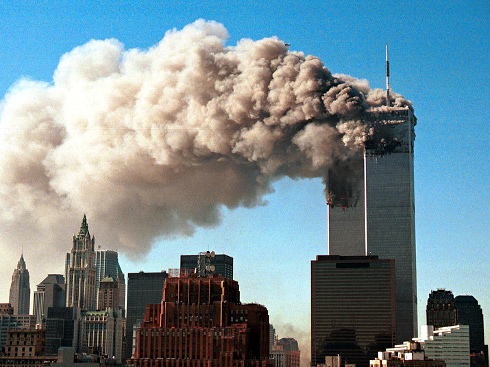 The second plane had hit the South Tower a minute or two earlier. Confusion reigned at this point, of course – but it seemed clear that an act of terrorism had taken place. I was particularly shocked since I’d often worked in New York over the previous few years, and the towers were a familiar sight. I’d been to the top of the South Tower myself, on my first visit to New York in 1987. I still have some photos taken from (and of) the observation platform, and they seem quite surreal now. I remember phoning my mum to get her to turn on the news, and I said to her that we were watching events that would live in history. I went onto a US messageboard that I frequented, to see what people were saying over there. People were stunned, speculating as to what had happened and reacting to news of the attack on the Pentagon that had just broken. I sat watching News 24 for another half an hour, then drove to Lordship Lane where I had a brief appointment. While walking from my car I remember hearing a man in his ’60s talking to someone in the street. He was saying that the Americans had thrown their weight around for years, and now someone had done it to them. Ten years later, it remains a more cogent analysis of the events of that day than many I’ve heard. From there I drove to Sainsbury’s at Dog Kennel Hill, and then came the moment that brought home the enormity of what had happened. I was listening to a special news programme on Radio Four, just as I parked. The presenter announced, with audible emotion in his voice, that the South Tower had collapsed. I couldn’t believe that. I had never imagined that the attack would prove to be so devastating. I drove home and sat in front of News 24 until the early hours of Sept 12th, trying to take in what had happened. I will admit to feeling nervous later in the evening. It felt as though the world had turned a corner, along a darker and more dangerous path. I had an awful, apprehensive “what now?” feeling. The media and the public dialogue on the Internet were full of confusion in the following days. I remember one or two ridiculous hoaxes appearing. And unfortunately at this point, an odd psychosis appeared to overwhelm America; one from which, a decade later, I don’t think it has yet recovered. I was surprised at the reaction from Americans on message boards, suddenly immersing themselves in patriotism and flag-waving, some insisting on a massive military response, as though terrorism could be defeated with the application of military force, like a nation state. Sales of guns in the US went through the roof around this time, as I recall – it seemed that Americans were anticipating shooting it out with Al Qaeda operatives in the street. Some perspective. As dreadful as the attacks were, they did not cause the most catastrophic loss of civilian life in history. Something like three-thousand people were killed in the attacks of September 11th, 2001. Most people have never heard of the MV Wilhelm Gustloff, a German ship torpedoed by the Soviets in 1945. More than nine thousand were killed, most of them refugees. And of course, the American military killed more than one hundred thousand civilians at Hiroshima and Nagasaki. In September 2004 I wrote that, three years after the attack, the terrorist leaders would be taking a measure of satisfaction from the West’s response to the atrocities of September 11th, 2001, and that the governments of the US and the UK had, sadly, played into their hands beautifully. Seven years later, I have no reason to revise that bleak assessment. The Islamist extremists got exactly what they wanted, and much more. Our governments had been provoked to destroy in subsequent years many times the number of civilian lives taken on 9/11. I doubt that bin Laden and friends could have dared hope that Bush and Blair would turn out to be such dramatically powerful recruiters to their cause.